omg, i can't get enough of this series if they make a fifth book my heart will explode. Lmfao I hope that daniel clearwater doesn't stop with these books. I really do want this book to come out as a book, not just an eBook. I can buy it on my iPhone, but I still prefer an actual book. I can't get enough of this series if they make a fifth book my heart will burst! My mom said she found the book stitches at the community library! I can't wait to get it! I heard its at the community library and i'm going there tomorrow to get it! soooo excited! i just finished Passing Strange, the third book!it was really good!!! omg i need this book!!! Like now!!! Only in December D= why???? So it's to late to yea. The hardcover??? 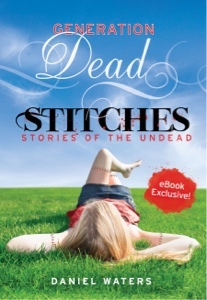 When will Stitches be out in paperback form. I just finished Passing Strange and I can't get enough of this series. I would love to know when it will come out. II have to ask does this start up on where passing strange ends? well stiches isnt really a 4th book it is a book full of mini stories is it not? but i realllllyyyyy want it to come out in paper/hardback! cannot wait for more books to come! I hope they make a movie! I used 2 wuv Twilight soooo much but now it's Generation Dead!!!!! I read the first book in less than a day! Do u just wuv the series sooo much?!?!? I hop they make a movie bout the series cuz, no offense Stephine Meyers, but this is better than Twilight! OMG I love this siries and I need to read these books they are the best. i love this series best iv ever read wanna read more!!! were is Tommy i need to talk to him its important !!!!!!!!!!!!!!!!!! !